Degas' Dancers: Behind The Scenes, At The Barre Edgar Degas was transfixed by the beauty of the ballet — but even more fascinated by the hard work of its dancers. The Phillips Collection in Washington, D.C., is showcasing an exhibit of his best behind-the-scenes ballet works. It's not often that an art show makes visitors stand up straighter. But Degas's Dancers at the Barre: Point and Counterpoint — an exhibition at the Phillips Collection in Washington, D.C. — has that effect. 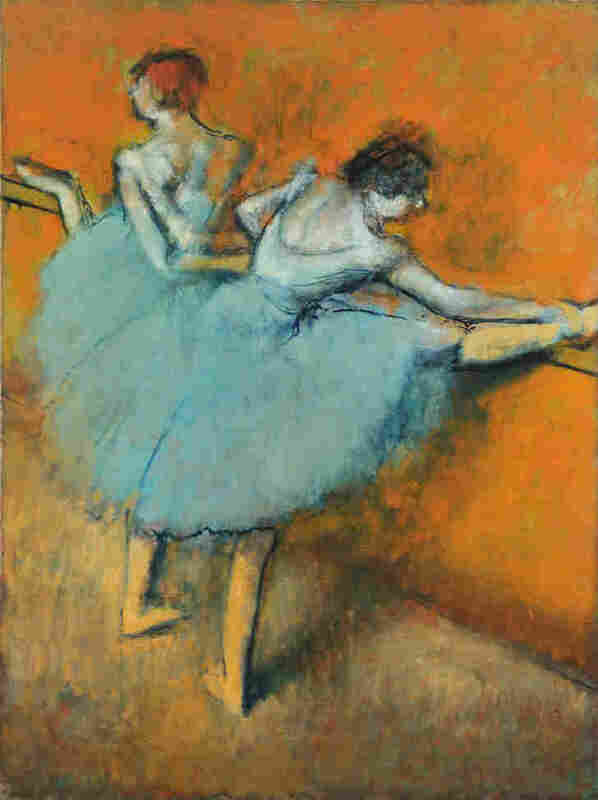 Ballet dancers in gauzy skirts stretch and bend and twist on oil and pastel canvases in the museum's galleries, which showcase more than 30 works by Edgar Degas. The focal point of the Phillips Collection's Degas exhibit is Dancers at the Barre -- a masterwork begun in the early 1880s and continuously revised by the artist for the next 20 years. The last gallery even includes two mirrors and a real ballet barre, mounted at hip height along one mirror. When a dancer from the Washington Ballet reached the end of the exhibit, she couldn't resist stretching one leg on the barre. "You can't just walk past it," says Morgann Rose, a principal dancer with the Washington Ballet. "I see a ballet barre, and I have to do something — [it's] kind of an addiction," she laughs. 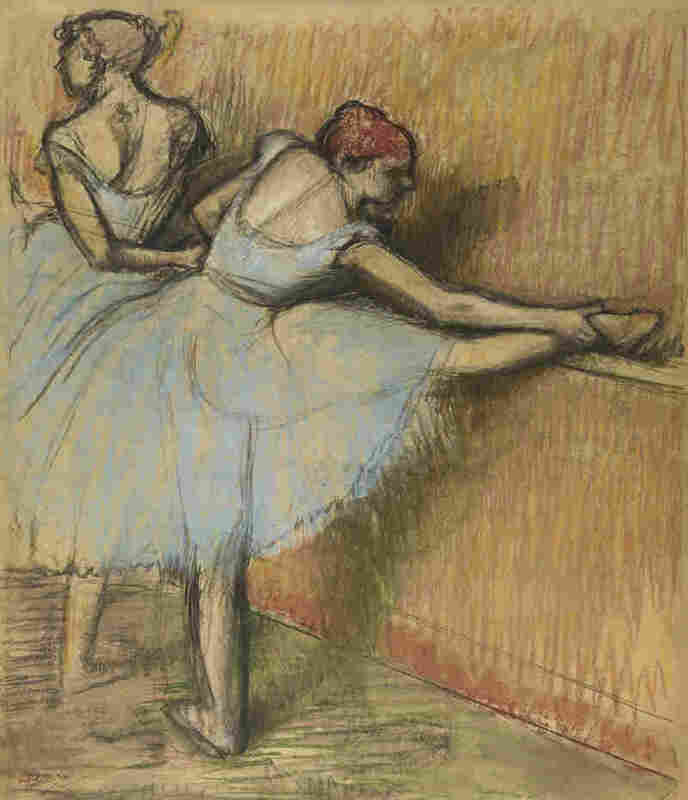 Rose recognizes herself in the painting that is the focus of the exhibition, Degas' Dancers at the Barre. "Every day begins at the barre — stretching, slowly moving your body, warming yourself up," she explains. These morning rituals are familiar to every dancer. Septime Webre, dancer, choreographer and artistic director of the Washington Ballet, describes the start of the day with veneration. "The studio is a temple," he says. "In the morning, the sunlight is casting a shadow on the studio floor, and one walks up to the barre and just begins to test out the stretches," says Webre. Dancers need to stretch all their major muscles at the start of the day. "It's something someone does for themselves," he says, "to prepare." Ballet dancers learn these stretches as young children and repeat them hundreds of times each day, until their dancing days end at age 35 or 40. Eliza Rathbone, the curator of the exhibit, draws parallels between a dancer's repetitions and the works of Degas. Over his lifetime, Degas created 1,500 paintings, pastels and drawings of dancers — more than any other artist. Vibrant colors help highlight the depth of field in Degas' 1873 oil on canvas, The Dance Class. "You have to draw and draw and draw — just like a dancer practices again, again and again the same steps, the same movements in order to achieve that beautiful grace and fluidity and mastery of their art," says Rathbone. Merce Cunningham, the avant-garde American dancer and choreographer, said "dancers shouldn't be dancers if they don't love the dailiness of it," adds Webre. 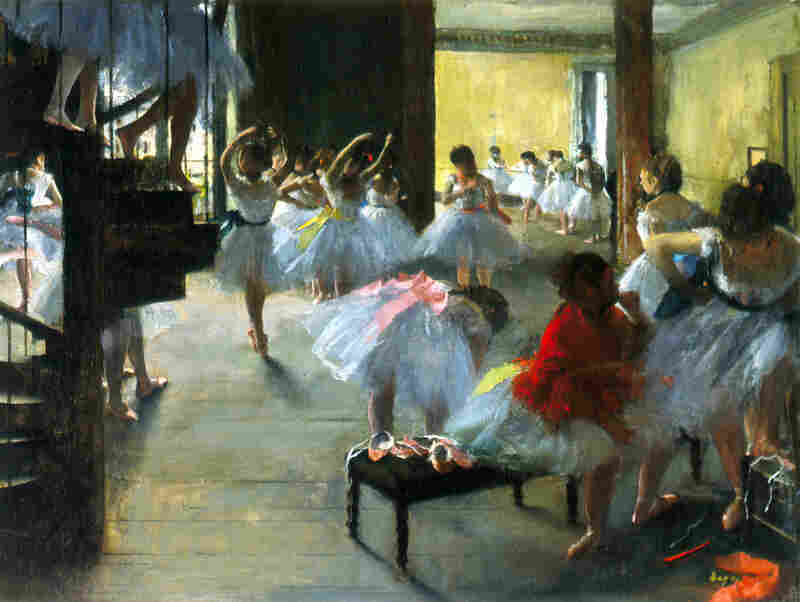 "It's that dailiness that Degas captured, and it's the dailiness that's in the spirit of his return to those subjects." Degas drew the dancers in studios, in rehearsal halls, and backstage in dressing rooms. Scholars say he was a witty, brilliant conversationalist, though he never married and maintained a reclusive life. It might seem strange that a solitary bachelor was allowed insider access to the Paris Opera ballerinas, but it was a common privilege for subscribers in the 19th century. Degas — a charming but reclusive bachelor — spent hours observing the ballerinas behind the scenes, allowing him to sketch candid moments like his 1889 Three Dancers. "A subscriber would have special access to seeing the dancers before or after the performance," says Rathbone. The dancers, who were lower- and middle-class women, welcomed such visitors to their behind-the-scenes life. Gentlemen of means might become patrons, or what they called "special friends." Degas' art emerged from these privileged, private moments. In fact, he rarely showed ballerinas in performance. Instead, they stretch at barres, pull up a stocking, or bend to adjust a satin toe shoe ribbon. In their pretty tutus and sashes, they are in the process of making art — that's the subject of Degas' obsession. "What we see [in performance] is such a small part of a dancer's whole life. [Degas] was interested in showing life — real life," says Rathbone. He loved those hard-working dancers. He once said they had "sewn up his heart in a bag of pink satin ... a bit worn, like their dancing slippers." It was this love that drove Degas to compulsively perfect his works. Starting around 1884, Degas made continuous revisions of Dancers at the Barre — changing the position of an arm here, a leg or head there. Using an infrared camera, Elizabeth Steele, head of conservation at the Phillips Collection, discovered the artist had changed the positions of the dancers' legs eight times on the same canvas. 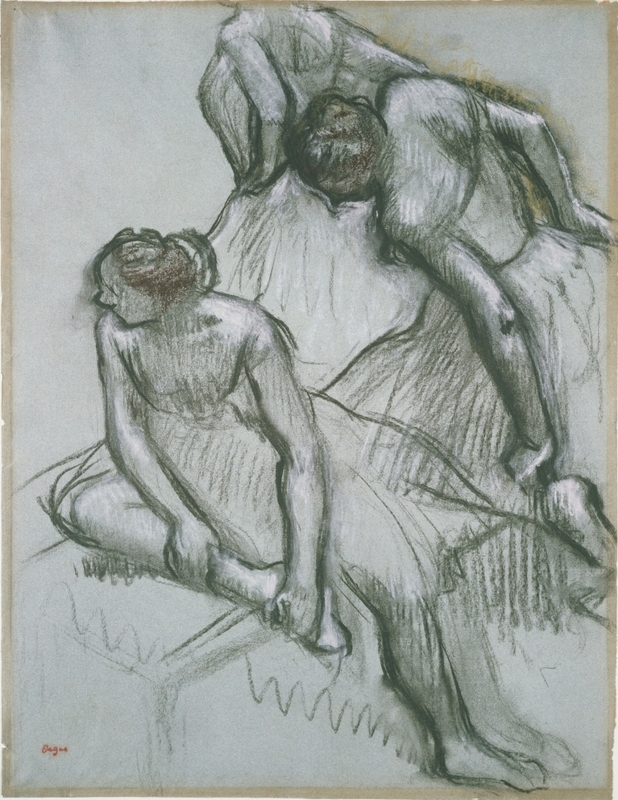 In a charcoal and pastel version of Dancers at the Barre, Degas tries out a variation on the dancers' head and leg positions. "He kept fussing with it obsessively," Steele says. But after all those revisions and reworkings, his final choice of leg positions was an odd one: "No one could possibly stand like that," says Steele. "Even the leg is growing from the wrong part of her body. It's total invention by the end; it has nothing to do with working from the model anymore. He's searching for the strong feeling of stretching, and this is how it comes out." Looking at the work as a dancer, not an art expert, Morgann Rose finds another awkward patch in the painting. "The foot on the left dancer looks like it's a little bit flexed, in my opinion. You want the beautiful line at the end of the foot to always curve in the direction of the pointed foot," says Rose. "Her foot is not quite as pointed as I would like," she critiques with a laugh. But Degas was creating art, not life. He was fascinated by the art of becoming beautiful, and the infinite vocabulary of motion that came with it. In his depictions of this process, Degas created an ethereal world of lovely illusions that all the hard work is designed to produce. Degas was a perfectionist — chronically dissatisfied, he worked on Dancers at the Barre on and off for 20 years. In fact, it was still in his studio when he died in 1917 at the age of 83. Now it is at the Phillips Collection until early January, along with other images from this behind-the-scenes look at dance.